Enjoy your time away knowing your pet is having fun with furry friends. Contact Camp Bow Wow Plano today at (469) 331-6223 to learn more. Your dog is your family – at Camp Bow Wow Plano, we understand that. As dog lovers ourselves, we take your pup’s care very seriously. That’s why we think of ourselves as so much more than just a dog boarding service. We are here to provide love and support for your furry family member while you are away—filling that gap as best we can until your return. Suite stays include access to webcams. A Certified Camp Counselor will cuddle up one-on-one with your pup and a blanket for snuggling, special belly rubs, story time, or other activities your fur-baby especially loves. 15 minute session. Perfect for active dogs who especially love to play one-on-one with their human! 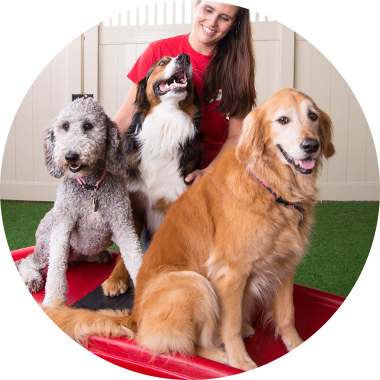 A Certified Camp Counselor will play your pup's favorite game: Choose from Fetch, Tug-of-War, Flirt pole, Scent Work, Treat Wobbler, Kong Challenge, Snuffle Mat or Snuffle Ball, Tunnel Games, Tricks for Treats, or bring your own toy from home. 15 minute session.